Palm Cay is today releasing its latest real estate offering, a $100m condominium and penthouse complex overlooking the community’s marina and ocean access. #Named One Marina due to its location, the residential community’s latest real estate offering was 40 percent pre-sold before its release to the general market, according to Myles Newell, Palm Cay’s recently-appointed director of sales and marketing. That interest, added Mr Newell, was divided between those who wanted to own a second residence at Palm Cay for family or investment purposes, and those who plan to move into the new complex and sell their existing property. He credited two factors for the positive response. “Palm Cay has a strong track record with property values appreciating consistently,” Mr Newell said. “The resort-style development has already had approximately 160 properties purchased since opening. Against this positive background, Mr Newell said Palm Cay’s developers are expanding marketing efforts with a multi-channel campaign focused on North America. Palm Cay’s first newly-designed, high-end real estate offering to come to the market in almost a decade features 84 two and three-bedroom residences. Two-bedroom units range in size from 1,780 to 1,940 square feet, and will sell for between $750,000 and $800,000. The three-bedroom units are selling from $1.5m to $1.9m, ranging in size from 2,751 square feet to 4,228 square feet. One Marina complements Palm Cay’s existing residential offerings, which include one and two-story condos at The Anchorage and Starfish Isle’s town homes. Owners can opt to place their unit in a rental programme. There are also slips available at the full-service Palm Cay Marina, a deep-water facility covering eight acres. The community covers 69 acres in total, and is located in southeastern New Providence between Port New Providence and Treasure Cove. The community’s developers recently invested a further $2m in upgrading its resort-style amenities. 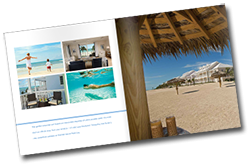 Palm Cay offers a members’ fitness centre, spa services, tennis courts, recreation areas, dockside café, a beach bar and grill, half-size Olympic swimming pool and a beachscape including private cabanas and a deck area with sun-loungers.